What better way to furnish your home audio needs than with architectural speakers? They are used and integrate well in modern smart-homes and are also favored for family room entertainment. Another great use is listening to music seamlessly from room to room. Additionally, there is a rising popularity in 3-Dimensional audio. While there are many uses for architectural speakers, they may or may not be the right choice for your audio needs. Here are some qualifying points that can help guide you in deciding whether architectural speakers or traditional box style speakers are right for you. What Is An Architectural Speaker? Since you’ve found your way to Aperion Audio, you likely know something about these types of speakers. 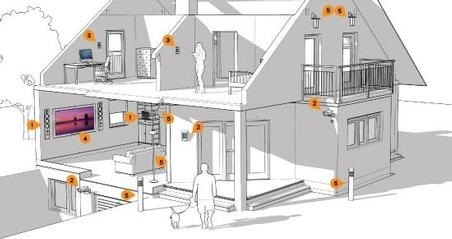 But for those who don’t, let’s breakdown what exactly an architectural speaker is and how they work. These are speakers designed to be installed into a wall or a ceiling. They usually don’t have a boxed enclosure which defies your typical speaker design. This of course might have you questioning build or sound qualities. But just because there isn’t a “box”, doesn’t mean it won’t sound good. Sealing the perimeter of the speaker to the wall or ceiling essentially allows your wall to act as an enclosure for the speaker because it’s separating forward firing sound waves from rear firing sound waves. At Aperion, we offer three types of traditional architectural speakers. First being the Intimus L6-IC(IC is for In-Ceiling). In ceiling speakers are the ideal choice for reproducing the latest 3D sound formats. They can be properly spaced and installed to give the best atmospheric sound effects. 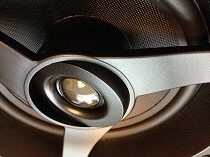 In ceiling speakers can also be used for surround sound in a traditional 5.1 or 7.1 setup. The second type is the Intimus L6-IW (IW is for In-Wall). The tweeter-woofer design replicates that of a bookshelf, making them an ideal choice for any ear level positioned speaker. Say you have boxed speakers for your front sound stage, but your couch positioning and room size won’t allow for large bookshelves to be wall mounted on the sides or behind. The in wall speaker would be a good qualifier for that situation, especially with its aimable tweeter. Lastly we have the Intimus 6-DT (DT is for Dual-Tweeter). This is a fitting speaker for whole-home audio distribution, not so much a home theater though. It utilizes two channels of your amp to allow for a stereo signal out of a single speaker, making it useful for a kitchen, bathroom or other area where you want the full stereo signal coming out of one speaker. Unfortunately, architectural speakers have gotten a bad rap, there’s no denying that. Thankfully architectural speaker designs have been reengineered over the years knowing that trade-offs in size and design would need to be compensated for by improving sound quality. Placement of an architectural speaker is critical for optimal stereo imaging. Given that they will be installed, if any changes need to be made you’ll need to bust into your walls, and that’s no fun. Also, driver configuration and design can make a huge difference too. An LCR (left, center, right) is a great way to build your front sound stage. While most boxed center channels may have a 3-way vertical array, you can also use a vertically designed speaker for your home theater. These work well behind an acoustically transparent screen. What are they? A box built and installed to the rear of an architectural speaker to prevent sound leakage to an adjoining room. Are they necessary? Depends on the design. If your chosen architectural speaker has an infinite baffle design, then it’s not necessary and most likely detrimental to sound quality. What is an infinite baffle design? It’s an open back speaker. When the perimeter of the speaker is sealed against a wall or ceiling, the wall or ceiling become the speaker enclosure. The architectural speakers that Aperion manufacturers are also an infinite baffle design, so a back box is not recommended. Let’s look at the mechanics and design of infinite baffle speakers. The ideal driver mounting would be into a solid flat panel of infinite size with infinite space behind it. The sound waves being produced are caused by the driver moving back and forth. This generates sound waves moving forward and sound waves moving backward. An infinite panel would prevent the rear sound waves from interfering with front waves. If the sound waves collide with each other, it would cause unwanted phasing or sound cancellations. If you absolutely must use a back box, then build the biggest enclosure that you can, increase the damping or absorption materials as well as internal asymmetrical bracing. This will to help remedy the unwanted acoustic anomalies or any internal standing waves caused by interior reflections. Every industry is constantly pushing new boundaries, especially the evolving entertainment industry. Sound designers have a vision of fully immersed audio and the engineers behind the design are diving in deep to make these sound fields become a reality. Producers want the sound effects of movies to be as realistic as possible, complementing the on-screen action and if you’ve ever seen a film where the sound and visual effects sync, it’s a thrilling experience. It’s no wonder the uprising of 3D audio formats like Dolby Atmos, DTS:X and Auro-3D were created. 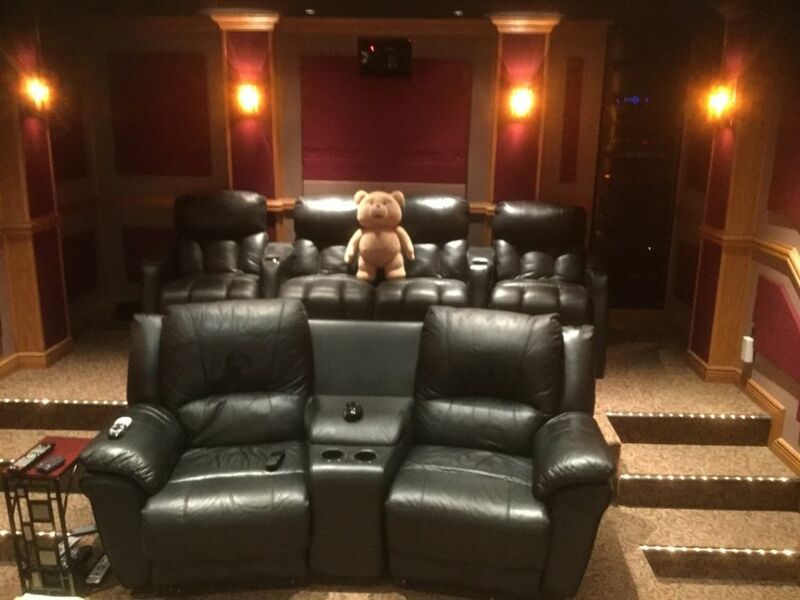 The best part is, these formats have been made accessible to us and we can recreate the movie theater experience in our own homes by installing additional overhead speakers. Your friends might call you crazy for adding more speakers to your setup, but I’m sure a quick demo of the awesomeness will leave them drooling for more. Or better yet, human and pet proof! You’ve probably had a pet puppy or cat that gets a random burst of energy and next thing you know they’re bouncing off the furniture, or worse, your speakers. My cat seems to have found a close connection, always snuggling the center channel, and afterward leaving the grille with light amounts of fur… Nothing a lint roller can’t fix! On the other hand, you may have experienced the wrath of a toddler. You never know what toy will be hurling through the air only to have your speaker be at the receiving end. And of course, the most unfortunate is the simple accidents caused by ourselves or our friends. You’re also more likely to get the spousal approval for the previously listed reasons. Will every speaker be built into the walls or ceilings? Ideally the front three speaker tweeters should be at ear level while seated. Maybe you choose to go with boxed speakers for the fronts and put the surrounds in the walls. While we strongly advise against putting every speaker in the ceiling due to lack of sound image quality, it might just work for your needs. Maybe the room you’re installing the speakers into is not intended for high quality listening because you’ve already built the ultimate man-cave territory for that. If you must go in the ceiling for the front speakers, then strive to have the woofers and tweeters angled at about a 45-degree angle to properly direct sound toward your listening position. Have you considered music playing through your entire house or your outdoor patio? It’s a nice luxury to have your favorite tunes playing when moving from room to room. It makes daily activities adequately enjoyable. Better yet, with home automation and everything connected to your Wi-Fi, you can control the music directly from your smart phone without having to trek it down to the audio dungeon for a simple song skip. What about your world-famous BBQ skills? Hanging out on the patio with friends and family can be more relaxing and fun with music, if everybody can hopefully agree to a genre… But it’s your BBQ so who cares what they think! After the install is done and you finally can hit play, architectural speakers have the ability to bring your walls to life. Like a scene from Jurassic World where the kids are in the gyrosphere, the sound experience can be exhilarating. There are varying views on architectural speakers, be sure to do your homework before deciding. 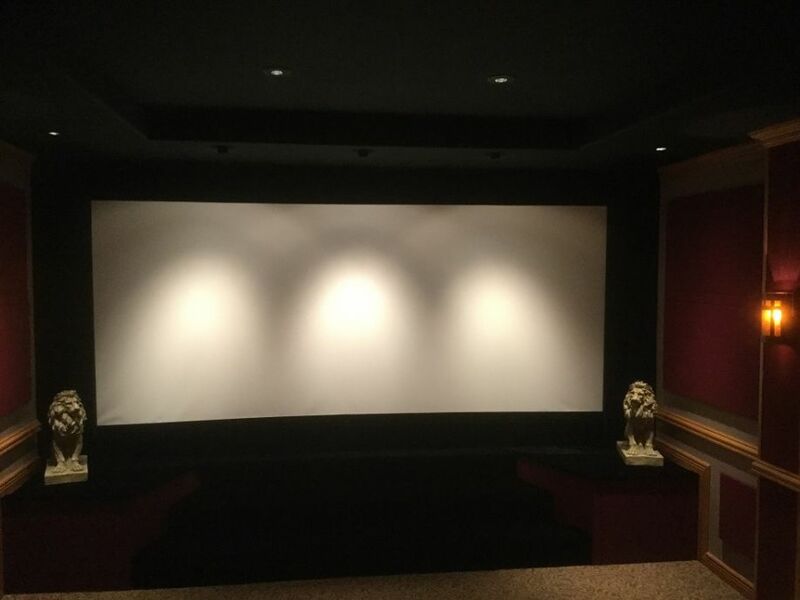 Research can go on for days, months or (we certainly hope not) years regarding which speaker to choose for your home theater or entertainment room. There are many home theater enthusiasts, including the Gurus here at Aperion, that are more than happy to offer up advice about speakers. Concealed or not, when your music or movies are in motion, your speakers should serenade you into happiness. Take a look at this wonderful architectural install from one of our customers!